Many real-life seasons passed, and I eventually loosened my grip on such tense pessimism (although I will always value Plath’s work). I even decided that it’s not such a bad thing, after all, to “reel giddy in bedlam spring” when the opportunity presents itself. Etro Dianthus: Carnation is one of my favorite fragrance notes, and I particularly enjoy it during the transitional seasons of fall or spring, since it can seem spicy and powdery at the same time. Etro’s interpretation pushes the softer side of carnation, with just enough delicate pepperiness for balance. Bond No. 9 Park Avenue: Bond no. 9’s more recent releases tend to receive all the attention, but when spring arrives, I always reach for my bottle of Park Avenue. This scent makes me feel as though I’m savoring a cup of white tea at a table set with fresh linens and a vase of narcissus blossoms. It’s crisp and clean, yet feminine. Yves Saint Laurent Paris Jardins Romantiques: This limited-edition fragrance was released in spring 2007, but it can still easily be found online. Its breezy re-imagining of the original Paris has sheerer layers of rose and violet, interwoven with dewy lilac and new grass. Plus, the charming bottle caters to every possible “April in Paris” fantasy. Frederic Malle Lys Méditerranée: I don’t wear many white florals, but once again, Malle delivers a classic idea with an innovative edge. Lys Méditerranée isn’t a waxy, greenhouse Easter lily: it’s a bunch of graceful, wilder flowers with their petals tumbled by a salty sea breeze. ElizabethW Magnolia: Speaking of white flowers, I always look forward to the one or two deliriously beautiful weeks in spring when I can sit under a magnolia tree in Central Park while I eat my lunch. This scent is the closest thing I have found to the magnolia’s creamy, lemon-tinged petals (minus the distress of seasonal allergies). Its matching body products are also a treat. Annick Goutal Quel Amour! : Camille Goutal created this fragrance as a remembrance of an occasion when her fiancé gave her dozens of roses and peonies. The sentimentality of its pink petals is countered by the tartness of red currant, giving wit and zest to its romantic sweetness. Caron Montaigne: I wear Caron Bellodgia all year long, but this spring I’m also in the mood for the reformulated version of Montaigne. Its oriental aspects have been toned down slightly, and the result is more buoyant, but still sophisticated: a sparkling brew of jasmine, mimosa, and ripe citrus fruits. Scent by Alexis Courtesan: A blend of candied violets offset by notes of green tea, Courtesan is both coquettish and smooth. It could be worn by one of the supporting characters from Colette’s Gigi as she rides down a tree-lined Parisian avenue in an open, horse-drawn carriage, wearing a satin gown and carrying a bouquet of orchids in her lap. Diptyque L’Ombre Dans L’Eau: This was my first “niche” perfume purchase, inspired by a mention in an early issue of Lucky magazine. (Thank you, Jean Godfrey-June!) I still cherish its fresh blend of black currant leaves and rose petals, which is delightfully wearable even when the weather turns hotter, not to mention the Art Nouveau-inspired illustration on its label. L’Artisan Parfumeur Voleur de Roses: Since spring weather is not always sunlit and balmy, here is a scent for April showers and other rainy days: Voleur de Roses (“The Rose Thief”) is plummy patchouli that somehow gives the impression of damp earth and a few wet-leaved rose bushes. Want to see more Top 10 Spring Fragrance lists? Check out Bois de Jasmin :: Perfume Posse :: Perfume-Smellin' Things. I really, really need to try the new Montaigne. Actually I have not tried even one of the fragrances on the list. Don't think that these are anywhere in Prague. Frederic Malle of course not, but the other ones like Caron..have never seen them. Or are these all the 'hard to get perfumes'? So glad you mentioned Bellodgia – just bought this and it seems perfect for spring. I frequently see ElizabethW products mentioned – but never see them for sale. Where do you buy them? Hi Silversheep, I'm not normally a heavy patchouli person, but for some reason, Voleur de Roses really seems to “bloom” on my skin in warmer weather and then it reminds me of freshly turned garden dirt more than anything else! I think it's less spicy than the original… It's still a “dressier” perfume than the others I mentioned, though, and definitely not some generic fruity-floral. Hi Marianne, I think most of these fragrances can be found online (although I'm not sure about international shipping policies on the various sites). Annick Goutal, L'Artisan, Diptyque, and Caron are available in Europe, from what I've heard. I'd check each company's website to find points of sale. Malle is less widely distributed, as you already know, and Scent by Alexis is a very small New York company. Bond and elizabethW also have websites, although I'm not sure about their international shipping. NST's “Perfume Houses” page might be helpful for links! Hooray! Bellodgia is one of my very favorite, all-year-'round fragrances. I also love Caron's N'Aimez Que Moi, which is a somewhat springlike floral, too. elizabethW's website doesn't seem to have a list of stores (unless I'm missing it? ), but they do sell through the site (elizabethw.com). I bet they could give you the names of some local brick-and-mortar stores if you contacted them. Hope this helps! Paris the original is one of my favorites! I am a floral perfume junky, especially white flowers. I have not tried the Paris that you mention but I think that may just be my next purchase. I also wear the Diptyque but I am not liking as much as when I first bought it. Michael Kors is another one of my favorites for Spring or anytime! I always love reading anyone's lists of just about anything. Thanks, Jessica. Voleur de Roses is a mainstay fall/winter scent for me, but I can definitely see it being perfect on a blustery rainy day. I need to check out Etro's line and Dianthus sounds great since I love the carnation note also. I'll need to get a sample, but would you say it's pretty unisex, not too sweet? I'm also really itching to sample Montale's Oeillet d'Inde even though I don't think it's available in the states. I've also not smelled any of them but I'm going in search of the YSL one right this second, it sounds great. Thanks for the inspiration for Spring smells. My fave this spring has been Annick Goutal Chevrefeuille. Sometimes I layer it over Jalaine Vetiver oil, which makes it last longer and gives it a dirty smell that I like. Les Nuits d'Hadrien for a day when I want to get things done; Songes for sitting around on the back porch dreaming of summer. Looking for a grassier vetiver, though, and thinking of ordering Guerlain. What do you think? Great list of scents! You made me giggle with your Plath reference, although maybe that's not the correct emotion… the angst of those late teen/early 20s years, ya know? I look back at myself and smile. Thanks, Tara! Nice to hear from a fellow floral-lover. In the Diptyque line, Ofresia is also very pretty. Uh, yes. The poem was probably hanging somewhere in the vicinity of my Joy Division poster. Hi Joe, Oddly enough, Etro announced Dianthus as its first feminine-only fragrance… but I think it's more “share-able” than their earlier Viccolo Fiori! It's nowhere near as clove-y as a carnation like Malmaison, but you might enjoy it as a warm-weather scent. I'm glad! Have fun exploring. Chevrefeille is a beauty! Goutal is always reliable for springy florals. I didn't like Songes on my skin (I can't actually *wear* jasmine), but I loved sniffing it on a blotter. Wish they'd make a candle in that scent! Ooh, I know very little about vetiver, I must confess. Maybe someone else here can comment on it! Great article! I had to smile a bit about the Sylvia Plath reference (I just recently read The Bell Jar and have read some of her poetry), but it was the mention of Scent by Alexis Courtesan that really made my day. I've been hooked on her fragrances since I ordered some samples from LaCreme and decided to try a few of hers, on recommendation of Kristen from BeautyAddict. Courtesan always reminds me of walking into a flower shop- just so beautiful and fresh. A lot more innocent than I was expecting. Eve's Revenge is also delicious…Blue Angel, however, was the only one I tried that I didn't like. It smelled too much like tobacco, I think, and it turned into an almost gourmand/ bad candle scent. Ugh. That has topped my list for worst scrubber so far. But, Courtesan is my darling and, indeed, perfect for spring. So funny. I used to loathe sunny days. Recently I heard the Smith's song “Meet you at the Cemetery Gates” and had to smile because it's so typical of that stage we all go through. Great list, although I have yet to try any of these. What kind of parfumista am I? Who doesn't love a list? And we all love lists, despite ourselves! I agree, Courtesan is definitely a more youthful member of her, er, profession! Eve's Revenge *is* a delicious fruit blend. And of all the Scent by Alexis fragrances, Venus in Furs is my favorite, although I love it most in autumn and winter. I'm always curious to see what Alexis will do next! What a beautiful post! It makes me want to take my computer and work outside on this beautiful, warm day. I just bought a purse-spray bottle of Quel Amour! It's one of those florals (like La Chasse aux Papillons and Diorissimo) that I can only wear when the weather gets warmer. Hello and thank you, E! Yes, we should state for the record: Today's weather in NYC is the best it will be for spring 2008. It's coincidental good timing for this post! La Chasse aux Papillons should be designated as a “Springtime Hall of Fame” scent, and so should En Passant, which Marianne has mentioned above. They almost go without saying. Great list, Jessica! I especially loved your mentioned of Quel Amour!, which is another Goutal I very much enjoy. It is such a lovely peony. I had the chance once to hear Camille Goutal tell the story behind Quel Amour!, and if I hadn't already loved the fragrance, that story would have persuaded me to try it. I am a new subscriber to this blog and clearly out of my element! 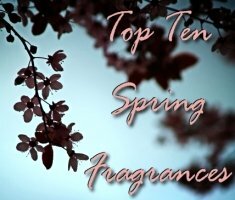 I know almost none of your top 10 Spring fragrances! Moreover, I'm part of your geriatric readership and can offer only personal favorites that I've been happy with for decades! – And I hardly ever have an interest in celebrity fragrances. OK, so here are my Spring contributions: I generally favor green scents, so I love to wear Estee Lauder's stepchild, Aliage. I'm also very fond of Chanel Cristalle and Molyneux Quartz. Heading into summer, I take my O de Lancome and Acqua Allegoria Herba Fresca out of the fridge. I guess I'm not yet a sophisticate, but, with the combined efforts of all of you very courteous fragrance mavens, I hope to catch up! I'm having a blast reading your comments! Welcome, Helene! and thank you for your “green” spring and summer picks. I definitely haven't tried all of those, but I do agree that Cristalle is a beauty and that “O” is very refreshing. Fragrances that someone has enjoyed for a long time are the best recommendations of all. Oh no. You said springtime in Paris. . Now I will have to try that YSL rendition, even though the original doesn't suit me. Funny you mentioned Montaigne–I just dug up my sample yesterday to wear. It always seems so fabulous, but unfortunately, Caron and I have issues I can't seem to get past-the dry down always makes me ill. I am trying to grow into them though, esp since I have a credit at the store I need to use! Today am enjoying En Passant….so very lovely…. Look forward to trying the others you mentioned! Well, if you absolutely can't find a fragrance at Caron that works for you (! ), take a look at the loose facial powders. They are divine! Love that leather jacket thought for Voleur de Roses! And don't worry, I can't quite wear the original Paris, either. Well, I'm nothing if not consistent. It took me a while to love Voleur de Roses–I smelled too much plum at first. But I have grown to love it. It does remind me of wet dirt and rain. Another scent that feels the same to me, although scent-wise in no way resembles it, is Bolt of Lightning by JAR. It is so forceful at the beginning, but melts into a beautiful green, woody fragrance. I think I put them together because they both whisk me outside where conditions are very dramatic and I am hyper alert to what is going on around me. I wear them when I feel like a drama queen! Mavoumeen, I smelled Bolt of Lightning once and I nearly fell out of my chair in the JAR boutique! Forceful, indeed. Great idea! Look forward to checking out the Caron powders next time I pop into the city…thank you! For a mainstream release, I'd like to add Stella to the list. Very evocative of a dewey, spring rose garden for me. We have to thank Stella for bringing rose fragrances back into the mainstream! It's a pretty one. Love your description of your doom & gloom late teens/early twenties days. I can relate. As far as spring fragrances go: Diorissimo, Diorissimo, Diorissimo. & for days when I'm feeling particularly wicked–Narcisse Noir. NN seems to express the darker side of spring for me. I live in Houston–which is a subtropical climate ; & springtime for us is the beginning of inferno season. (100% humidity, soaring temps, ozone & hurricane watches & mosquitoes out the wazoo) Narcisse Noir seems to hint at that crazy darkness…. Ah… “Black Narcissus.” Sounds like a wonderful choice to me! I like the idea coordinating fragrance, weather, and mood. They're all closely connected! Floral Girl here too! Go team. I have the YSL Jardins Romantique and Micheal Kors. The YSL is way lighter and very fresh mowed lawn scent. It is so light my animals don't run from the room!–a first. People tell me they can smell the rose-violet but it just smells…well springy and pretty. I like to hear from another Micheal Kors lover. It seems people either love it or find it cloying…like Fracas can be. Estee Lauder's beautiful Love is a flanker that is creamier and greener than the original. Springhmmm. I like the original Coty Muguet Des Bois, Le Chasse aux Pallion, Amethest by Geisha, with the Lilacs, and Monyette Paris. I'm just throwing things out there because I'm tired. Sorry Oh by the way, does anyone know if Annick Goutal”s (I know I spelled that wrong) honeysuckle fragrance is very light? I would also like some advise on a wedding scent mentioned in post by Guerlain called Chamade?? Someone said it was “heartbreakingly beautiful”. Who wouldn't want that? I'm a floral girl and it's listed as an oriental floral, so I fear it. I don't like heavy orientals but I think I want to buy it so I too can feel poetically heartbreakingly beautiful. What do you all think? There's not a good review on Os Moz or here. But I respect the experienced opinion better. I hope I don't regret writing this in the morning, fogive my sleepy head. I've never tried Amethyst by Geisha! Do you perhaps mean the Violet from the Aroma M Geisha line? That's one that very nearly missed my list: lilac, violet, and cocoa. Very unusual! Goutal's Chevrefeille fragrance is a beauty. Not extremely long-lasting, but perfect for spring and summer. I wouldn't call Chamade a heavy oriental at all (not like Opium, or Youth Dew…) It has a lot of “presence,” as most Guerlains do, but I think it would be a lovely dress-up floral for any time of year. It may have some good reviews on Makeupalley.com, since lots of Guerlain fans congregate there.